Maïmouna Guerresi is a photographer, sculptor, and video installation artist. She lives between Italy and Senegal. The universe of Maïmouna is the result as much of the chemistry between cultural and religious influences, as the fusion of different artistic languages. 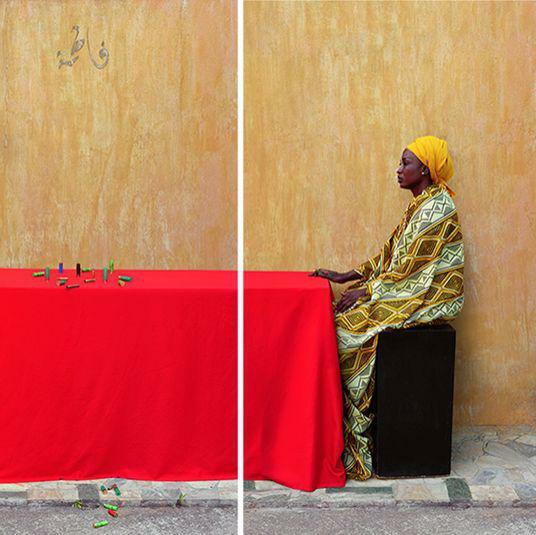 Linked both to Italy and Senegal to Western culture as well as Sufi philosophy, her works reflect a dual culture and a dual belonging and, above all, the search for an equilibrium between the two worlds. Maïmouna Guerresi was invited to participate in the Italian pavilion Venice Biennale in 1982-1986-2010 as well as Documenta K18(1987) in Kassel, Germany. In 1991 Maïmouna travelled to various Muslim countries in Africa and converted to Islam while in Senegal. Perspective on the relationship between women and society, with particular reference to those countries in which the role of women is most marginalized. For over twenty years Guerresi’s work has been about empower- ing women and bringing together individuals and cultures in an appreciation for a context of shared humanity, beyond borders – psychological, cultural, and political. She uses recurrent metaphors such as milk, light, the hijab, trees, and contrasting white on black to create awareness of the vital unifying qualities of the feminine archetype and its special healing potential. Guerresi’s art is uniquely authentic. Her work is inspired by personal experience and cultural contexts that reference universal myths, the sacred realm, and the female condition, all of which are seen as vital expressions of the human form: an essentially spiritual and mystic body. Through photographs and videos of silent, austere, veiled women in domestic scenes and individual poses, her work functions as both metaphor and provocation. Guerresi’s images are delicate narratives with fluid sequencing, as well as rational analyses: women dressed in white, enveloped in chadors, fixed within their own tradition and isolated from and by it in the contemporary world. Her Fatimah image suggests the woman as Mother- Earth supporting us in the original energy cycle of Space-Universe- Infinity.